Today we take a closer look at the “Elements of Islay” range by Speciality Drinks. Packaged and labeled like they come straight from a chemistry laboratory, some of these bottlings experienced quite a price change. At the time of writing these lines we find 53 Elements of Islay whiskies in our whisky database (simply type in “elements of islay” in the live-search field). All of them are of course bottled in the characteristic 500ml chemical-style bottle. Each “element´s” name of this range is a two letter distillery code followed by a release counter. So “Ar6” describes the sixth Elements of Islay release from Ardbeg, while “Pe3” stands for the third Port Ellen release of this range. There are also blends in this range (called “Peat”), but for now we solely focus on the single malt bottlings. Although the packaging may suggest otherwise, the Elements of Islay range is bottled without chill-filtration or colouring at original strength. So no chemistry in this laboratory bottles. Naturally, not all of the bottlings reached the whisky auction market yet. In total there exist 68 (by January 2018) from which 53 can be already found in our database. The distilleries covered by this range are of course the well-known Islay distilleries and their various subbrands like Octomore or Port Charlotte. With nine bottlings (all of which already in our database), Ardbeg accounts for the most followed by Laphroaig and Caol Ila with each eight. On the places follow Bruichladdich, Bowmore and Lagavulin with each seven bottlings. Above we plotted the number of price observation we find by distillery. Clearly the Port Ellen bottlings are the most traded of the Elements of Islay range. The five Port Ellen bottlings were traded more than 200 times. Behind is Lagavulin with 144 price observations for the six bottlings in our database. For getting a better understanding of how the auction prices for this range evolved we of course use our indices. First we created a Elements of Islay index which describes the value development of all those 50 bottlings for which we have more than 3 price observations. The index starts with a value of 100 in December 2010. We see that it was in late 2013 where the index started to climb. In the years ever since we see a steady increase of around 10% per calendar year. We now further brake this index down into the three major distilleries of the Elements of Islay range which are Port Ellen, Lagavulin and Ardbeg. So we created another index for each of this distilleries which only contains the price observations from the respective bottlings. Clearly it is the Port Ellen bottlings which experienced the highest price increase. In total the five Port Ellen bottlings gained almost 80% in value over the past six years. The nine Ardbeg bottlings experienced an almost 20% steady increase. Far more volatile is the price development of the six included Lagavulin bottlings. In total they lost more than 20% from 2011 to mid 2013 only to close-out in late 2017 with a overal +20% too. We noticed that the Elements of Islay range is particularly popular at german based WhiskyAuction.com (WA). Out of the 870 price observation we find, 732 come from WA and only 138 from ScotchWhiskyAuction.com. At last we want to point out two remarkable Elements of Islay bottlings. The Lagavulin Lg3 bottling is the most traded Elements of Islay release we find in our database. All of the 71 price observations come from WA. Prices started at a level of around 200 but quickly dropped. The latest price observation are slightly below 100 Euros. 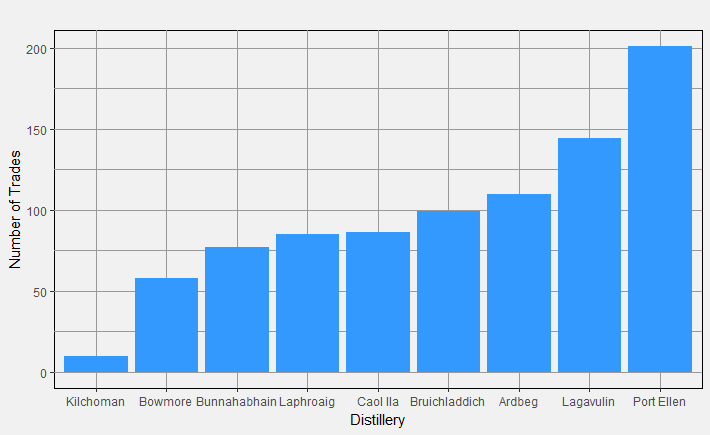 The Laphroaig Lp2 is currently the most expensive Elements of Islay release. In May 2016 it traded for 782 Euros. Compared to its initial price level of below 200 Euros this equals an almost 400% incraese in value. All of its 25 price observation also come from WA solely. It has been more than three years now since our whisky database went online for the first time. 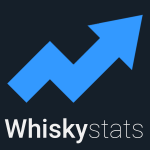 And like whisky itself, Whiskystats continues to mature over time. Here is a small recap of the current state and what is about to come!